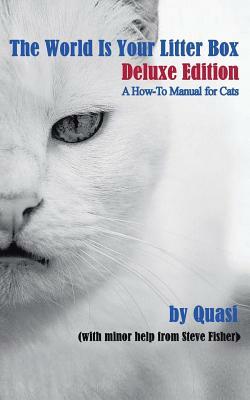 Quasi is back with more wit and wisdom for his fellow felines in this expanded version of The World Is Your Litter Box. Disguised as a cute cat book so human cat lovers will buy it, The World Is Your Litter Box: Deluxe Edition is actually a how-to manual for cats, written by one of their own to help make the lives of all kitties even more pleasant, entertaining and enjoyable than they already are. Smart, meow-out-loud funny and loaded with "cattiude," The World Is Your Litter Box: Deluxe Edition is sure to please even the most finicky cat (and human) readers. Prepare to laugh your tail off Cover Photo Courtesy Maia Coimbra Cat Illustrations by Prawny Vintage www.theworldisyourlitterbox.com.